I am sure Everyone has got his/her Salary Slip in June. I have asked a number of Govt: Employees and got the POSITIVE response. Haven’t received you March, April and May Payslip? PIFRA Monthly Salary Slip – How to Unsubscribe or Change ID? If you were getting your monthly employee’s salary slip regularly and for the past two or three months, you are not getting your Payslips then do these two things. Check your Promotions Tab in (new) Gmail upgrade. This month I did not receive my Salary Slip. I was usually getting it in the Primary Tab. Since there is always the bulk of messages in Social and Promotions so we don’t check these out. As you can see the photo below that I have marked Employees Services as important, still, it is appearing in the Promotions Tab. Also, check out your Spam Folders. Google is now sending emails those are not marked as important or starred. So make sure to check out your Spam Folders. Still face any problems feel free to ask in comments below. 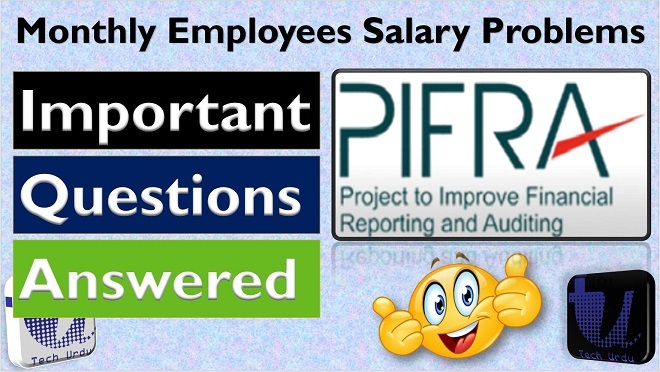 [Original Post] Well, well, well, I got a lot of questions regarding PIFRA Monthly Salary Slip. Though I have already uploaded 02 Videos on the topic yet it seems a lot of problems are being faced by you guys. Though I replied to Each and Every Comment, still it seems a lot needs to be explained. So here you are a third Video Based on your Questions and Problems. In this Video I have featured those questions (though I got a lot) those are most important and link to other questions on the same subject. Still, face any problems please let me know in comments below. I’ll try my best to cover these in another video (if needed). Guys in this video you will learn the whole process of getting your Monthly Salary Slip on your provided E-mail (G-mail) ID. Guys I’ve already made a video of How to register on PIFRA (above) and get your Employees Salary Slip on your Email. I’ve received a number of question regarding email problems on PIFRA. Like how to unsubscribe? How to change ID? How to remove old ID? How to recover Password? etc and other such questions. In this video, I’ve tried to solve these problems. Still, if you face any problems please let me know. See Also: Well, here is a series of SEVEN Videos that let you prepare from PC-I to PC-V with all practical examples.Do you know that now you can Prepare PC-I all by yourself? (This course is usually not free, but here it is totally free for you). So hurry up! You should now send an email to PIFRA and register your complain there. You can also get your issue resolved by the DAO/AG Office. Please register on PIFRA website. I have nt received my payslips since july.i have cheked my spam and promotion tab too. You mean 4 months slips. Then you should instantly send mail to PIFRA or consult AG/DAO Office regarding this matter. Plz, Check your spam and promotions folder in Gmail account. Still, if you don’t see the slip you should consult with DAO (District Accounts Officer) office or AG Office to get your issue resolved. sir mujhe abhi tak august ,sept, 2018 ki salary slip nahi mili plz send those slip thank you. October k start ma mily gi September ki slip. Dear sir.month may.jun .july .agu.sept…2018 can not raceived my pay slip. Please send you details to PIFRA via email and state all your matter in detail along with your complete name and job details. please send me my august and September 2018 salary slip i have sent you many massage but no response. Dear aap District Account Office (DAO) jaa k apni is problem ko solve krwa skty o easily and quickly. Vendor Number of an individual (having a personal no) can be checked from PIFRA site. Check for your school maybe you’ll find it. Respected Sir. mujhe abhi tak july and august 2018 ki pay slip nahi mili na hi june ki so, plz send me immediately my required months pay slip thank you. Dear if you don’t get your slips there is surely a missing which should not be. Regarding sending your previous slips. Pifra does not send previous slips. Sorry. You can get your slip from District Account Office or Accountant General Office. Sir… I have not received last two months payslip july & aug what’s reason behind that..? Reason is these slips are system generated sometimes such missings happen. Plz Check your spam and promotions folder. Still, if you don’t see the slip you should consult with DAO office to get your issue resolved. Sir April aur July 2018 like salary slip Abhi take nahi mili. Agr is month nhi mili then hopefully next month mil jay gi aap ko. If not by now then you will get next slip in October. Also, check your promotions and spam folders. I have needed of salary slip July 2018 for the submission of Nts teachers regularization documents, Still I have not received my salary slip of July 2018. Check your spam and promotions folder. Still, if you don’t see the slip you should consult with DAO office to get your issue resolved. What about August? Also, please contact your district account officer to get your problem resolved. Dear sir, plz send my July 2018 payslip. Yes in the first week of August. Depends on which date of June. On a safe side, aap ko August ma mily gi. Hmmmmm … aap apny spam and promotions folders check kry. Agr phr be slips nhi milty aap pifra ko mail kry apny is problem k baary ma. Dear jo months guzr jaaty hai un ki slips aap DAO/AG sa ly skty o.
I need your quick answer, is there any way to download/access previous months salary slip? i registered myself this month so how can i get previous month payslip online? No, there is no way (as far as I know). What about April and May? June ki slip b nhi mili kea? have u got all previous slips? You should w8 for August Slip. Hopefully, you’ll get it. dear slips pifra aap ko send krti hai. agr aap ko continuously slips nhi mil rhy then plz pifra sa contact kry and apni problem share kry. btw spams and promotions folders zaroor check kry. Aap ko July k end ma slip mily gi. dear slips pifra aap ko send krti hai. agr aap ko continuously slips nhi mil rhy then plz pifra sa contact kry and apni problem share kry. btw spams and promotions folders zaroor check kry. wahan pa aksar log check nhi krty. ya masla kaafi logo k sath hua hai is dafa. Did you get June Slip? Almost all employees got their slips this month. Plz send your detailed message on pifra and state your problem. such problems are solved directly on pifra forum. June k month ki slip ka wait kry plz you’ll get it. June ki abhi tk kisi ko nhi mili. i have not received my salary slips for the month of march April and may. Sir I have not received my salary slips of two consecutive months April and June 2018 and I had not got the salary slip of April 2017 as well. In June you’ll get it hopefully. And June k slips abhi tk nhi mily. First week of July milengy. June k first week of july milengy. April, May and june ki salary slip abi tak ni mili. June ki slips tu almost sb ko mili hai. plz check promotions and spam folder. You’ll get it in June Insha Allah. You’ll get it in June – Insha Allah. Sir March, April and May 2018 ki abhi tk salary slip nahi i.
Shafique Sb aap kuch din aor w8 kry. June k end ma sb ko slips milty hai q k y financial year ki closing hoti hai. June k end ma milengy sb ko. july k start k days ma hopefully. i ve checked all folder present in account. Imran aap kuch din aor w8 kry. June ma sb ko slips milty hai q k y financial year ki closing hoti hai. April k bad May ki mili hai aap ko? and April ki aksar logo ko nhi mili Pifra ki tarf sa. Agr aap saary options already try kr chuky hai then I suggest k is month wait kry hopefully aap ko slip mil jay gi. Email not send due to some errors. June ma mil jay gi aap ko Insha Allah. Cuz it is closing month of the year. Everyone will get paysilips for this month. June ma mil jay gi aap ko Insha Allah. Cuz it is the closing month of the year. Everyone will get payslips for this month. You mean March April and May? Well this month you’ll get it hopefully. February sa nhi mili aaap ko? I think you should contact PIFRA. You can mail them. Paysilps of March ,April and May 2018 are not received on my email address. hassantheboattari2526@gmail.com. hope the same Will be send as soon as possible. AoA sir meri April & May,2018 ki salary slip nai show ho rahi lakin pay account mein transfer ho rahi hy ? First of all, hopefully, you’ll get your slip this month. secondly, how did you contact pifra (call/email etc)? I contact through email as u said in the videos. so what response did you get? You should w8 for this month and update me plz. March ki mili thi aap ko? Have u received you march slip? if yes and you are not getting for continuous 2 months then you’ll get in the third month. I have not received the salary slip for the month of March and april. What is the issue . Please tell. March and April ki nhi mili aksar logo mujhy b nhi mili thi. But is months aksar logo ko mili hai including me. Aap yaqeenan new subscriber hongy. Aap ko hopefully next month mily gi. March and April Slips are late you will get in next month. Aprail kay slip nahi mila mujhy waja sir g? Slips of April have reached to most lately. Wait for a couple of days you’ll get it. If you don’t you’ll get in next month – two months slips. What about April Slip? did you get it? register kb kea tha aap na? AOA sir mujay June ki pay slip NHi mili BHT urgent hay. Please send kr dain. Ya Waja bita dain k q NHi mili . Pehlay regular Milti rhi hay. It is unusual k aap ko June ki slip nhi mili. Still app spam folder and promotions (gmail) k andar check kry. Hopefully wahan pa aap ko mil jay gi.